What time can I arrive on Friday 6th? -You are welcome to arrive any time from 1pm on Friday 6th, but the main site won’t be open until 4pm. -Unfortunately, we are only allowing Guide Dogs on site this year. – Of course! We would love for the whole family to join in the fun. There are child tickets available in the tickets page. Children under 5 entry is free! -No, there will be a dedicated car parking space next to the camping field. -Only live in vehicle with a pass will be allowed to park within the camping area. A pass is available for purchase in our tickets area of the website. Vehicles with a pass will be escorted onto the camping field. Any vehicles parked in the camping field will not be allowed to exit until the end of the festival. Can I have a BBQ, fire or camping stove? -Sorry, no fires or BBQs will be allowed this year due to safety. There will be a communal fire organized by the event and there will be hot food available at reasonable prices on site. Vegan, vegetarian, gluten free options will be available. Breakfast will be served each morning also. -Camping stoves are o.k. Please ensure that you carefully follow the manufacturers instructions. Do not use them in a tent, make sure they are well away from any flammable materials and keep them away from any ignition source e.g. smoking when setting up. Do not use camping stoves to heat up your tent! Use with extreme care! Avoid if possible. Free hot water will be available in the tea tent for tea, noodles, etc. Or just buy delicious hot food from our reasonably priced catering service. Is there a sink I could use? Is there anything else I need to know about the camping field? -Please look after the field as it is grazed by sheep all year around. We ask that you do not leave metal tent pegs in the ground, or leave ANY litter, especially glass! -The festival is family friendly so please keep noise down to a minimum in the camping field (Especially from 10pm – 10am). There’s a communal fire and other areas e.g. the dome stage that will be open until 3am for any night owls. -Anyone making excessive noise in the camping field will be asked to contain their excitement. -There will be a quiet camping field available for anyone wanting as much peace and quiet as possible. -We kick off at 6pm on Friday 6th, 12 noon on Saturday 7th, and 12 noon on Sunday 8th. – Yes! We have a full Sunday line up – as equal to Friday and Saturday! Don’t miss out! Is there a fancy dress theme? – Yes, we will be having a fancy dress theme on Saturday all day. 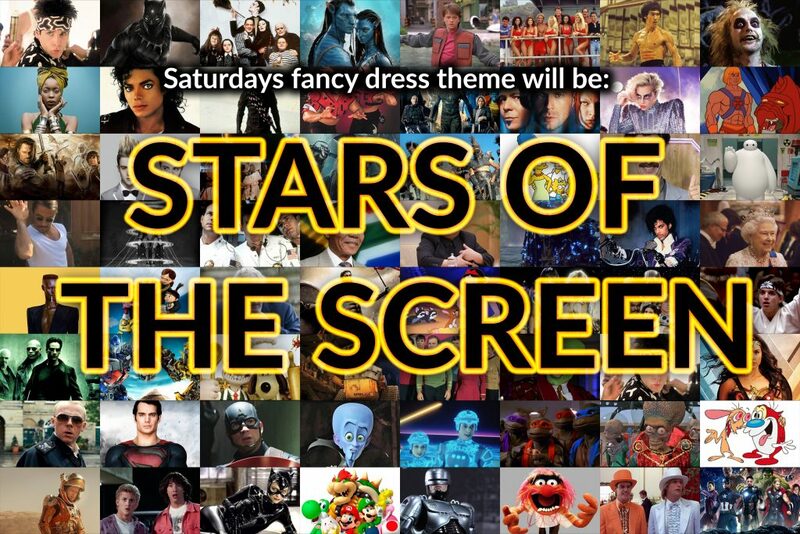 The theme is ‘Stars of the screen’. There will be a special prize for the best outfit voted by the audience. As for the other festival days, feel free to put on dazzling festival attire to your heart’s content. We love colour as it brings out the best in people and that’s exactly what we’re all about. -Yes, there will be a dedicated car park for ticket holders only. Cars parked in the car park may leave at any time but we would encourage that you minimize entering and exiting unnecessarily as there’s only one single lane road to the site. We would like to avoid traffic as much as possible. Can I bring my Campervan or van? -Yes, although if you wish to sleep in your van or Campervan in the camping field, you’ll need a live in vehicle pass which is available in our tickets area of the website. -Yes, but it will only be allowed in the camping field. Only drinks purchased from the bar or cocktail bar will be allowed in the arena area. -Yes, but glass will only be allowed in the camping field. We recommend that you do not bring any glass if possible. Can I use my own cup? -Yes, you may use your own cup to purchase drinks from the bar. But not glass. This would help minimise waste so we would encourage that you bring your own reusable cup (picnic type cups). How expensive is the bar? -We pride ourselves on having a very affordable bar. Beer is approximately £2.50-£3.00 a pint, with wine and mixers also cheap to buy. We also have a full range of soft drinks available and a cocktail bar. We rely on the alcohol sales to help pay for the artists. Any profit made will be donated to a number of charities. Why drink warm cheap beer from the boot of your car when you can have ice cold beers a low prices. Cheaper than your local pub! -No, unfortunately we don’t have the necessary drainage capacity to have showers. Will there be a shop or supermarket? -No, there’s no shop onsite but there is shops close to the festival site. 20-min walk or 5-min drive away. -Yes, the two stages, catering and tea tent/dome are under cover. There’s also a large covered area next to the barn stage which will have hay bales to sit on, so no matter what the weather brings, we will have a fantastic time. Will there be vegan, vegetarian and gluten free food available? -Yes, there will be a range of freshly made hot food available from our catering service at low prices. Are there any recycling bins? -Yes, also, we have chosen a waste disposal company that will separate the general waste bins to take out any recyclable materials. How far will the bins be? -There will be bins strategically placed throughout the site so there’ll always be one close by. They will be emptied daily to prevent wasps or smell from accumulating. -Yes! We will be releasing a design and pre-order form very soon. -To keep up to date, follow our Facebook pages and add yourself to the event on Facebook. We normally announce news here. -The vital question “where is it? !” Well due to the festival’s exclusive nature the location is TOP SECRET until tickets have been purchased. We can tell you it is about half an hour from Manchester towards the peaks by train and then less than 1 mile from said train station. Directions will be sent out to ticket holders closer to the date.